A dog owner has been ordered to muzzle her German Shepherd after it jumped a garden fence before attacking her neighbour and her dog. Maria Flower, 40, of Imperial Way, Hemel Hempstead, appeared at West Herts Magistrates’ Court on October 30 after her dog Kya was found to be dangerously out of control on June 7. 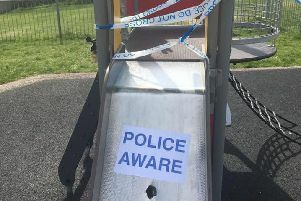 During the incident, Kya jumped over the fence and bit a Yorkshire Terrier and his owner during an attack in their own home, leaving them with several injuries. The small dog was left with deep cuts to his hind leg, meaning he needed £400 of vet treatment. His owner was left with cuts, scratches and a black eye. The court ordered that Kya must be kept under control in a public place and Ms Flower should maintain her garden fencing to ensure the animal is contained. If these rules are broken, the magistrates’ warned Ms Flower that Kya would be destroyed. She was fined £80, ordered to pay compensation of £432.06, a victim surcharge of £20, court costs of £85 and a criminal court charge of £150. It it understood Ms Flower has now moved away, but the daughter of the victim, who lives nearby and wished to remain anonymous, said she is concerned that it could happen again elsewhere. She said: “We were out in our garden with our daughter when we heard mum’s screams and her dog’s squeals. “My daughter was terrified – we told her to go into the house and shut the door while we went round to my mum’s. “It was snarling and snapping its teeth – it was very scary. “It took my daughter a long time to be able to go to her Grandma’s house without being scared. “It’s been a horrific ordeal for the whole family.